Mobile device is one of the most important and key point in everyone's personal life. Nowadays it's not only a mobile device, it's a full featured miniature computer too. With all, you have to consider certain things when you are going to buy a phone. Once you buy a phone it's all about you and it. So you should be comfortable and reliable with your device. Main concerns should be the operating systems, screen sizes and features. First of all you should be smart enough to select the correct operating system. As there are three main operating systems in the market such as iOS, Android and Windows. Out of these three you should carefully identify the features and weaknesses and come to a conclusion to move forward. Second point is you should go to the right size. You can either select a big screen or a smaller screen mobile. If you are reluctant to carry another tablet you better move with a larger screen and if you are more in to watching movies and playing games and at the same time viewing photos of course the right mobile is a larger screen one. If you are not interested in any of these, you better move to smaller screen which have a compact design. In third, you should be more considered to the processor, RAM, Screen, Storage and Expansion. First regarding the processor, it's the heart of your phone, it should be a fast one. So it will not waste your time on opening the apps, play games which you need in a smooth way. It should support the multitasking feature in your mobile. So need your special concern on this. Then the RAM, it plays a main role in system memory. You can select a higher RAM like 1 GB or 1.5GB so the loading of the applications from the memory, switching between them are faster than a blink of an eye. Then the screen, it is another important point, you should consider the brightness, sharpness, viewing angle and colors. Regarding the storage and the expansion this is where all your information get stored. So it should consider how much the internal memory and how much you need as the external memory. You better move with a phone with a micro SD card slot so that you can expand your memory whenever you need. Fourth point is the Camera, make sure to select the best camera which comes with the phone. Make sure to check and ensure the camera qualities before you finalize the things. Then another point which you should consider is the battery life. Better you go for a high battery capacity phone, as you do lot of surfing and if you are getting lot of calls it's much better you move with a good battery capacity phone. Then it comes to the carrier. You should select the best and reliable career for you. At the same time you should consider the budget you have as well with this. You should check the coverage and data speed as well with your carrier. Finally you should consider the upgrade plan too. You should get all the information regarding the insurance also. So if you are interested in buying a new phone make sure you go through all these information and take a decision to move. How to save mobile's battery for log hours? How to hide the identity from truecaller? 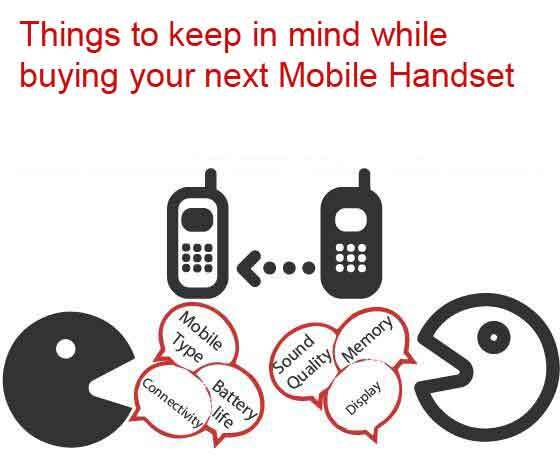 Must read befory buying a mobile? How to stay safe while shoping online? How to track IMEI Number?